Kitakyushu Forum on Asian Women (KFAW) is pleased to announce its FY2013 recruitment of our foreign correspondents. KFAW foreign correspondents program aims at expanding an information network through reports on the status of women in the world. So far 266 correspondents from 40 countries have reported their cultures, women’s status and social issues from gender perspective. We suppose every country or region might have expressions or customs based on stereotypical gender roles. These are challenges to be addressed by society as a whole to make use of full capacities of men and women. We would like you to give us your original reports on how men and women equally take active parts in society free from stereotyped perception for gender roles. （２）Correspondents must turn in 3 reports in Japanese or English. 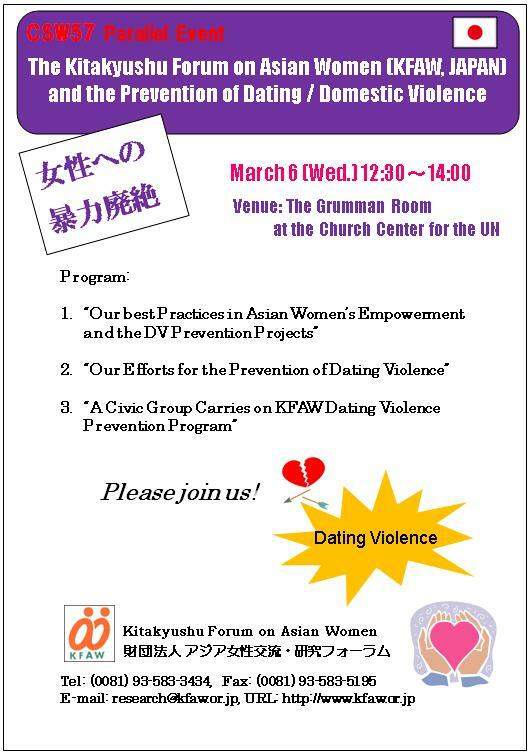 The Kitakyushu Forum on Asian Women (KFAW) takes part in the CSW every year as a qualified NGO of the UN ECOSOC. In addition to participating in CSW57, KFAW will stage an international seminar which is the part of the NGO CSW Forum for Women that coincide with the regular session of the UNCSW. Violence against women and girls occurs everywhere in the world. Japan is no exception. Violence against women and girls causes each victim immeasurable suffering and pain. The 23rd Kitakyushu Conference on Asian Women will deal with international trends regarding violence against women and girls, as well as relevant efforts being promoted in Europe, Korea and Japan, including problems to be solved, thereby contributing to the realization of a society free of violence. The keynote speech will be delivered by the Executive Director of White Ribbon Campaign UK, a male organization that calls on men to eliminate violence against women. He will speak about efforts being promoted in Europe, followed by a panel discussion. He will report activities of the White Ribbon Campaign, and the Council of Europe Convention on Preventing and Combating Violence against Women and Domestic Violence. She will speak about efforts being promoted by the U.N. and Japan regarding violence against women and girls, and future challenges. She will report countermeasures to eliminate violence against women and girls in South Korea. She will speak about the actual situation of violence against women and girls from her position as a counselor. Kitakyushu Forum on Asian Women (KFAW) is pleased to announce its FY2012 recruitment of our foreign correspondents. KFAW foreign correspondents program aims at expanding an information network through reports on the status of women in the world. So far 257 correspondents from 38 countries have reported their cultures, women’s status and social issues from gender perspective. Ms. Michelle Bachelet, Executive Director of UN Women, has contributed to Asian Breeze No. 64. UN Women was established in July 2010 by the UN General Assembly. In her article, Ms. Bachelet explained her organization’s efforts to solve the problem of violence against women and girls, one of the organization’s priorities. In addition, Asian Breeze No. 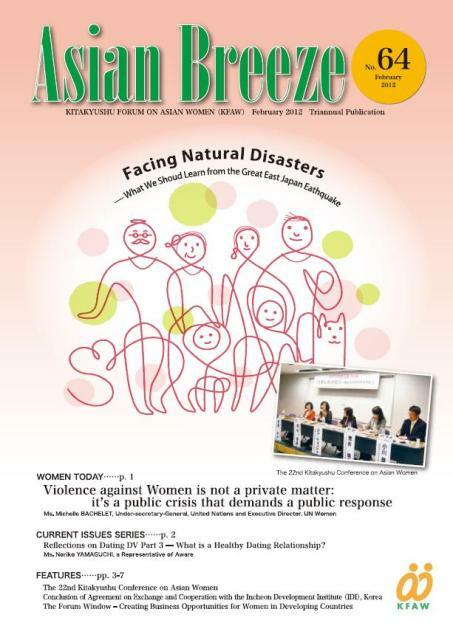 64 provides a special article on “Facing Natural Disasters – What We Should Learn from the Great East Japan Earthquake,” the theme of the 22nd Kitakyushu Conference on Asian Women held in November 2011. The event featured the Great East Japan Earthquake and dealt with topics such as the necessity of a gender-equal perspective for disaster damage prevention measures and in the progress of reconstruction and restoration efforts, as well as what we can and should do now. Asian Breeze No. 64 also carries reports on “Youth Culture Today” by foreign correspondents in Malaysia and Hong Kong, as well as an article on the conclusion of the Agreement on Exchange and Cooperation with Incheon Development Institute, Korea. We are sure you’ll enjoy reading this newsletter full of stimulating articles. Fill in all required information. Order forms can be sent directly from this page. To send by fax or e-mail, use the Fax/E-mail Order Form. We are currently conducting a questionnaire of readers to further improve Asian Breeze. Please download the questionnaire response form. 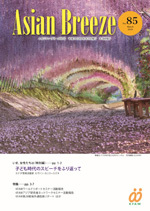 After completion, e-mail the form titled “Questionnaire of Asian Breeze” to info@kfaw.or.jp. Your cooperation would be truly appreciated.